Influential composer of the classical era, Wolfgang Amadeus Mozart was born in the city of Salzburg. The city is located in central Austria, close to the German border and, as you might expect it, comes with a lot of things for you to discover, especially in terms of music and culture. That’s why, today, we decided to take Mozart with us and spend a day in Salzburg together. We’ll be at the end of your road, waiting for your transportation from Salzburg airport to get you in the heart of the city. Since we are spending the day with Mozart, it’s only natural that we have our breakfast at Café Tomaselli, found on Alter Markt 9. It is believed that Mozart himself spent his mornings in this café and that his favorite drink was almond milk – that sounds like a very healthy choice of beverage for breakfast, right? After we’re done with our breakfast, we can have a walk in the Old Town of Salzburg, which has seen little changes from the time Mozart used to walk around it. After enough walking, we’ll reach Mozart Square where we can see his statue. To end our morning, we can go visit the Salzburg Cathedral – it is one of the most significant Baroque building in Salzburg and it is also the place where the baptism of Mozart took place. If we are in Salzburg, we might as well try some chocolate, right? You can satisfy your taste buds with a box of Mozartkugeln, literally translated to Mozart Chocolates, which can be found at Konditorei Furst, on the Brodgasse 13 Street. Of course, you can find this type of chocolate in many other places, but this very place we have mentioned a bit earlier is the one in which the patissier Paul Furst came up with the idea and created this chocolate. The Mozartkugeln is basically made out of a pistachio marzipan center that’s been hand-dipped into dark chocolate nougat. After eating the finger-licking good chocolate, we can head to Bibliotheca Mozartiana, on the Schwartzstrasse 26 Street, library that contains around 35,000 titles. It is also the most extensive Mozart library in the entire world. Since we’re walking with Mozart, it’s only natural that we end our day with a concert or an opera performance. If you prefer a concert, then head over to the Mozarteum, but if you prefer an opera performance, you can go to the Salzburg Marionette Theater for a piece of a Mozart opera. 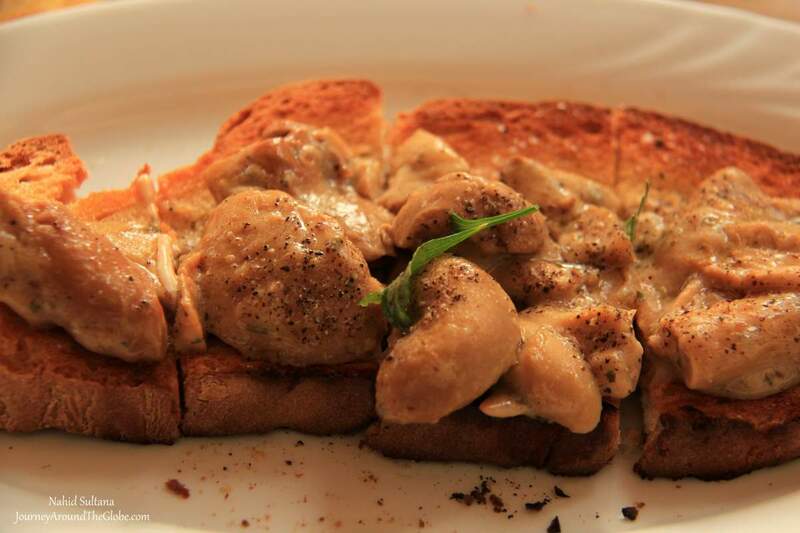 After such delight, you can safely go and enjoy your dinner or visit one of the local taverns. Fideler Affe is the place you want to see if you want to taste some beer and enjoy the place’s coziness, while Hotel Sacher can provide you with the dinner that will get you ready for sleep. So, now you know what you should be doing in Salzburg after your airport transfers company in Salzburg of your choice drops you off to your accommodation – that is if you want to spend your day with Mozart. Ireland – one of the leading tourist attractions of the world is beyond beauty. Everything that this country embraces is beautiful and lively. From the countryside to the town-life, everything about Ireland is worth visiting and knowing. Because of such abilities, Ireland has easily been able to rule over the hearts of a number of people around the world. From its rich history and culture to the modern lifestyle – the country is a blend of everything. The big city life of the country is worth all the hype, however the small cities and towns of the country have their own charm. This is the town which describes the culture and beauty of Ireland at its beautiful best. This Irish town is quaint and is full of everything that the tourists need. There are beautiful little shops, few small pubs as well as a castle. You can spend a couple of days in this sweet town by interacting with the friendly town and exploring the places in and around it. Your tours of Ireland would be incomplete if you don’t visit this beautiful seaside village which is quintessential and calm. This village is located on to the west coast of Galway within the region of Connemara and this town is everything about some of the most pristine locations that you would ever encounter within the country. There are fine bars and restaurants as well. Another beautiful town in the country of Ireland is Clonakilty which attracts a number of tourists because of its colorful nature and appearance. This town is located down on to the Southern tip of the country and is one of the most popular towns for the tourists. Recently, this town won the Tidy Towns award and a number of other awards which certainly justify the popularity of this town. This town is a must visit. Another beautiful small town which would serve you a fun-filled time is Skerries. This place is the best location if you are wanting to have a day trip after staying the city of Dublin. There are a number of restaurants and bar and you can easily sit down, relax and grab a drink to enjoy the beauty of the place. Visit this place on a sunny day and you will thank us later. Another beautiful town of Ireland which can take you completely by surprise is Ardara. This place describes the rural beauty of Ireland at its very best and hence serves everything that you wouldn’t otherwise find in any city of Ireland. Situated near a Gaeltacht area, your trip to Ireland must include a visit here. This town is more than picturesque and is definitely worth a trip while you are exploring Ireland during your vacation. You can take part and make the most of a number of activities here such as hiking, fishing and exploring the beautiful old castles. There are cozy hotels where you can stay back to enjoy a number of activities taking place around you. If you are planning to visit the beautiful Cliffs of Moher during your trip to Ireland, then a visit to Doolin would serve you the best choice to stop by and relax. This town is situated only 15 minutes away from the cliffs and you can surely stop to relax and chill. There is a famous pub here where you can explore the nightlife of Ireland. This place serves as a fairly big town when compared to other small towns and villages of Ireland and it happens to be one of the most beautiful towns of the country. This place embraces a beautiful scenic beauty to look after. If you are into hiking or any other adventure sport, you will love this place as it has got a lot to offer. However, this hike is definitely not for the faint hearted. This place serves you as the perfect base camp if you are wanting to explore the rest of the country. Kenmare is a gorgeous town which is filled with ample of restaurants and bars to help you with all sorts of recreation. If you happen to stay here during snowfall, call yourself lucky as this place gives a stunning view to your eyes. This town has a lot of things for the tourists and you can take part in a number of activities to have a gala time. Don’t forget to visit the beautiful Molly Gallivan’s Cottage and Traditional Farm which happens to be 200-years old. Visit this amazing small towns and villages of Ireland and bump into the additional beauty of this country. Slap bang in the middle of Central Europe, if there we had to describe the Czech Republic in just one word it would have to be ‘cocktail’. No no no. This has nothing to do with its fame and notoriety among stag parties or thirsty backpackers but rather its history. You see, the Czech Republic is a cocktail made up of its Bohemian past, Moravian splendor and Slavic charm. It is a city that celebrates the historic diversity that blends all things Gothic and Baroque and that is what makes it an absolute must see nation for anyone that has even the slightest interest in what came before us. There is only one place to start your cultural exploration and that is the St Vitus Cathedral, so get book your cheap flights to Prague, pack your camera with plenty of films and then head to this magnificent structure that has been built over a 600-year span. Hidden within its thick walls you will find a mosaic of The Last Judgement and the tombs of people you have heard legends about, like Charles IV and St Wenceslas, among many more. If you are caught in the tough decision over which Prague museum you absolutely must explore, you’d do well to find a better contender than this National Gallery. The collection is just a mind-boggling array of art that stretches back as far as the 1800s, including pieces from little-known artists like Van Gogh and Picasso and Klimt. What’s more, there are four floors for you to wander about with your mouth as wide as it has ever been. If you were to stop a local on the streets (hopefully one that speaks English) and asked them what their most savored simple pleasure is in life, they will tell you it is the eight o’clock stroll across the Charles Bridge. It is just the most stunning place in the city; fresh snow at your feet, a sea of pastel-coloured buildings stretching as far as the eye can see and architecture of every kind. The reason they say eight o’clock, however, is because the circus comes to town at nine and by circus we mean tourists. When you are a kid and you imagine what a fairy-tale castle to be like, chances are it was something akin to this. It is magnificent. The ranks of tall spires and enchanted towers and palaces that could melt your heart a thousand times over. But it isn’t just something nice to look at from the outside, for within the walls lay galleries and museums and buildings of old. This place is celebrated by the locals as being one of the greatest treasures in all of Central Europe and for good reason too. If it is old that you are after then you need to carve out time to see the Old Town Hall, which was founded in 1338. It is a patchwork of medieval buildings that have been sewn together over a series of centuries, each adding their own eclectic charm. In terms of the centerpiece, that title definitely goes to the Gothic tower that looks over it all with a salute, not least because of its Astronomical Clock. 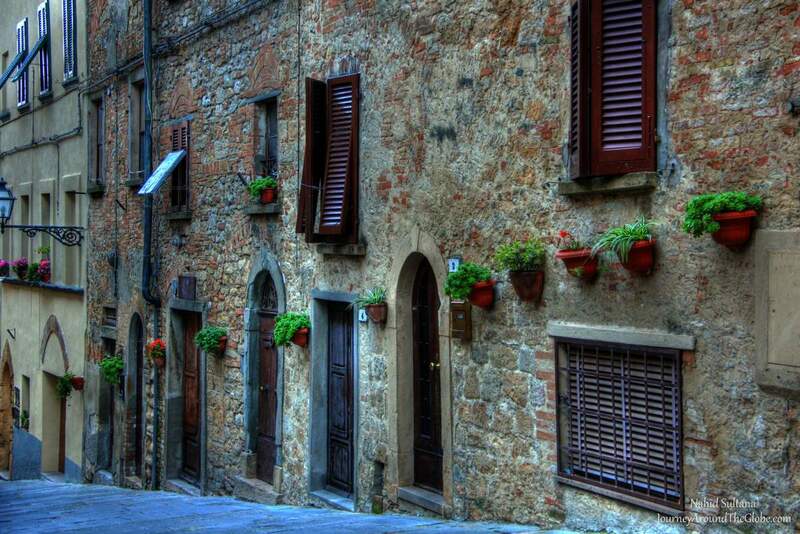 VOLTERRA: Volterra is another medieval charm of Tuscany and another town that attracts thousands of tourists every month. 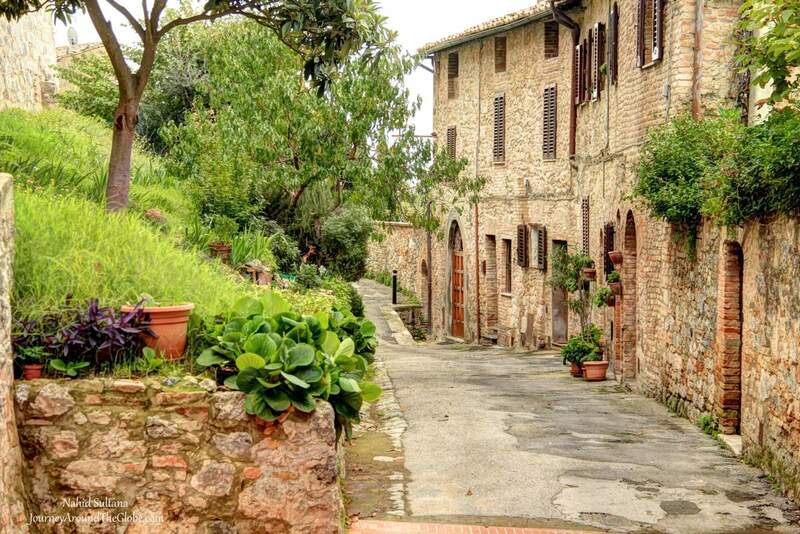 Like San Gimignano or Siena, this is one of many walled cities of Toscana.. 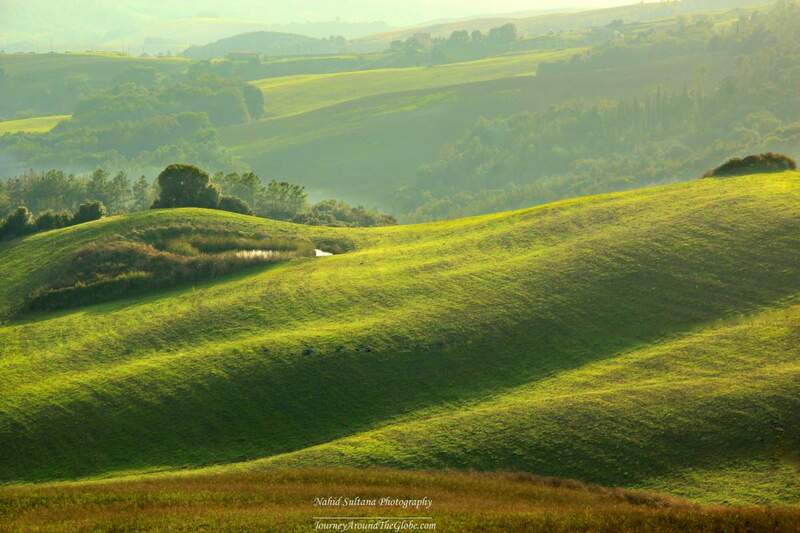 Situated on a hill, Volterra gives beautiful views of the countryside and nearby small hills. Getting lost in the cobble-stoned alleys and being surrounded by enchanting old buildings make this city awesome. For us, it was a small and sweet trip. 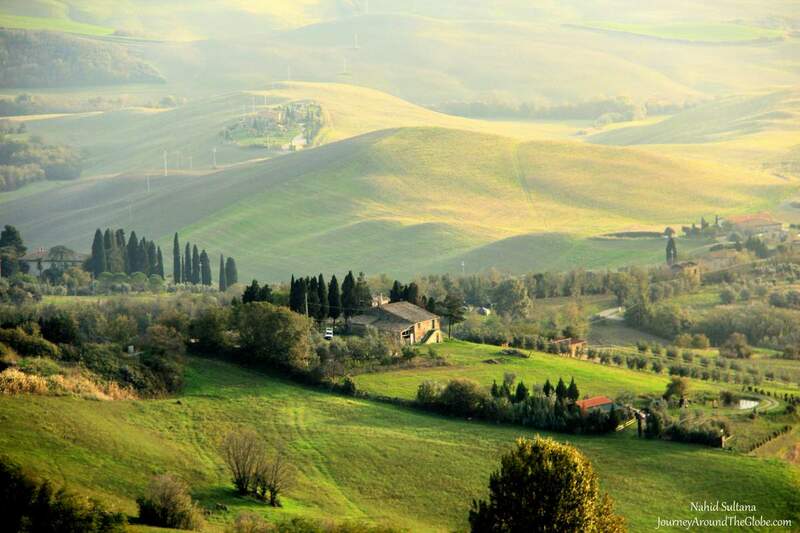 If you are in Florence or Siena, making a day trip to Volterra would be perfect for few hours. 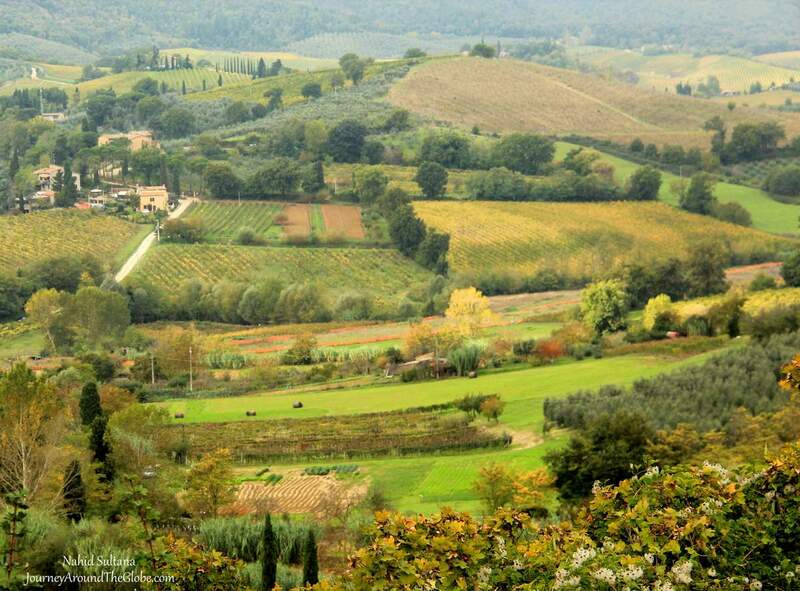 TIME of TRAVEL: It was our second time in Tuscany in October of 2013. 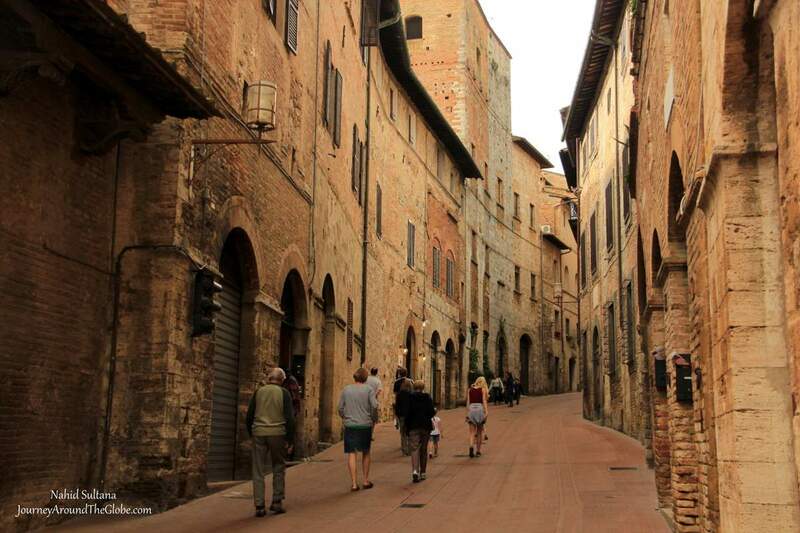 After visiting Siena, Florence, and San Gimignano, Volterra was our last town to visit in this region of Italy. When we arrived here it was almost dark and it got a bit windy because of the elevation. I think it’s always a good idea to carry a light sweater, especially around this time of the year. OUR HOTEL: We stayed in “My One Hotel in Radda” for the whole time in Tuscany. 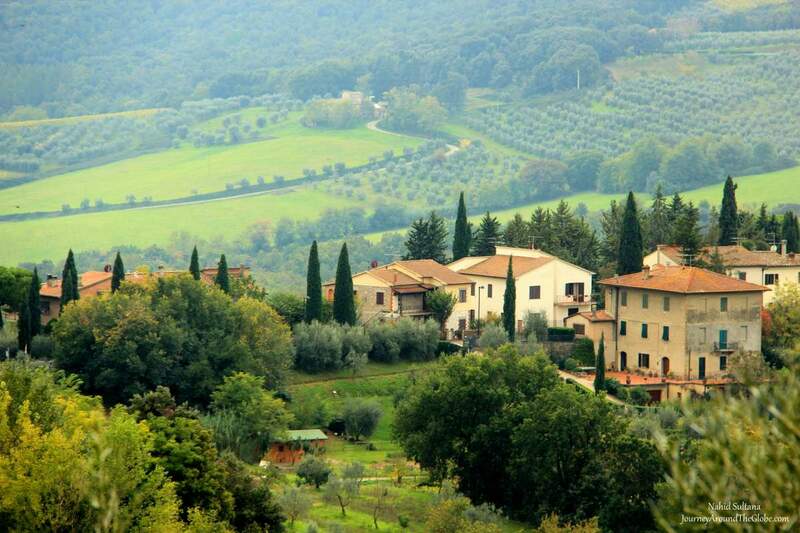 It’s located in the hills of Chianti…a place which is not only famous for its wine, but also for its art, history, natural beauty, and simplicity. This was a 4 or 5 star resort. We had free grand breakfast buffet, spacious room, clean linens, and excellent customer service. But above all of those, the best part of it is the view from our balcony or from the hotel terrace. Standing on the upper terrace one early morning, I got the perfect glimpse of Tuscan hills and trees hugging the autumn clouds…it was a breathtaking feeling. I felt like I didn’t need to get out, I could have just sit in my hotel balcony all day and enjoy Tuscany right from there. It took us about hour and half from Volterra to our hotel, thru some winding and hilly roads. EATING and SHOPPING: We were in Volterra for a very short time, only about couple hours. 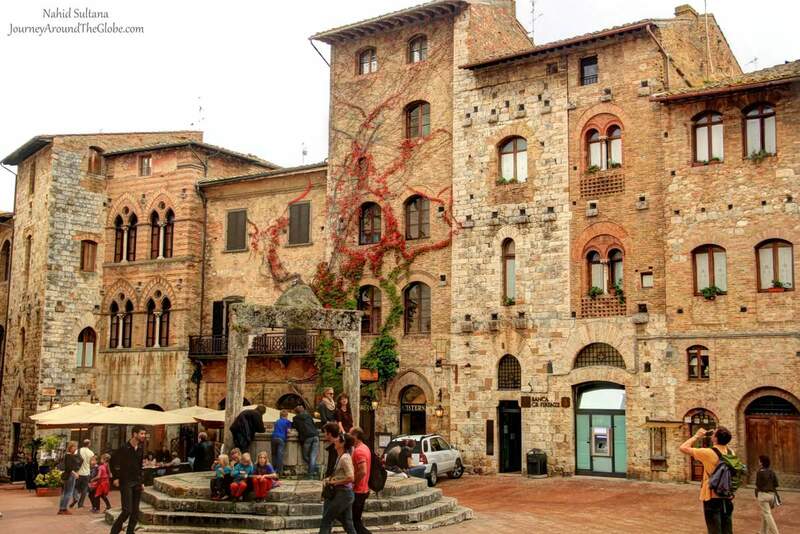 We had lunch in San Gimignano before coming here. But if you are hungry in Volterra, you can find plenty of bars, grills, and restaurants in the Old Town…unfortunately most of them were closed or getting ready to close by the time we were done visiting all the spots. 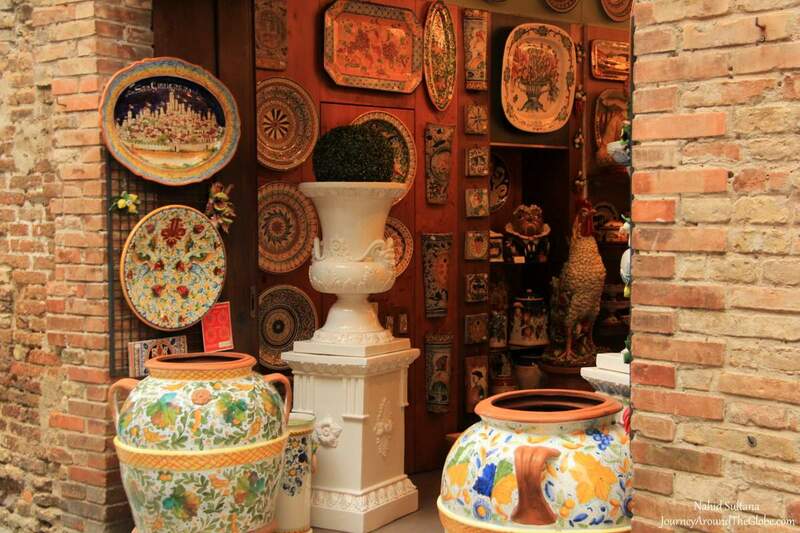 Volterra is very well-known for its alabaster items, ceramics, and pottery arts. 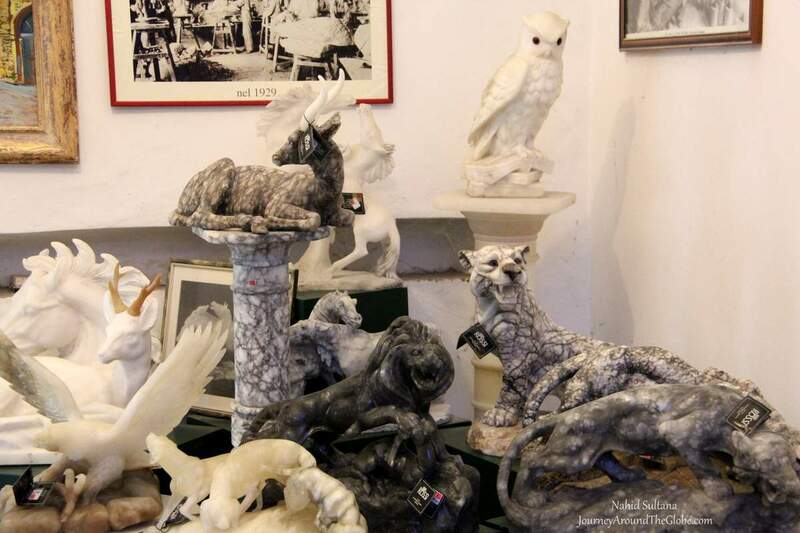 There was a big souvenir alabaster shop right before we entered the Old Town, very close to the parking lot. Alabaster can be very heavy depending on the size of gifts you are buying but they all looked very gorgeous with reasonable price tags. 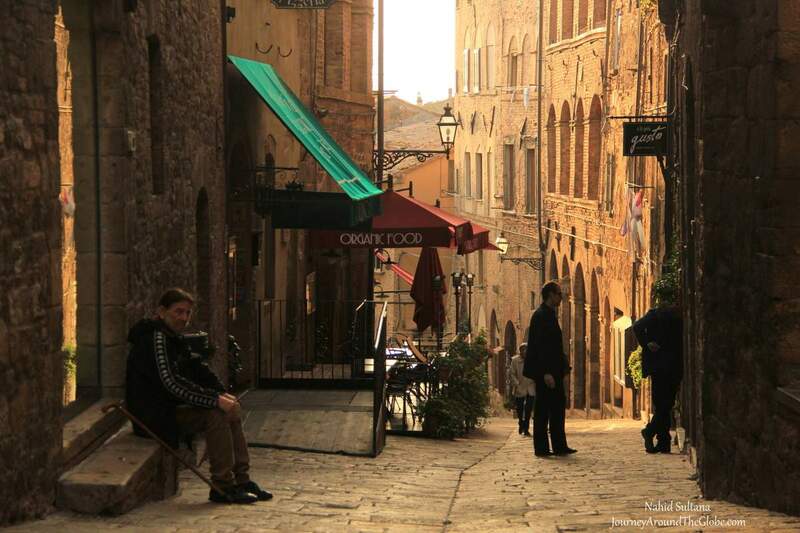 PLACES WE’VE VISITED: We only got to spent couple hours in Volterra historic Old Town. We decided to take a trip to Volterra when we figured we still had enough time to kill after visiting San Gimignano.So made a short stop here before heading to our hotel in Radda in Chianti. The drive was absolutely breathtaking from San Gimignano to Volterra. But once we reached there, it was almost end of the day and it quickly started to get dark outside. We parked our car outside the Old Town and started walking towards the main sights as soon as possible. 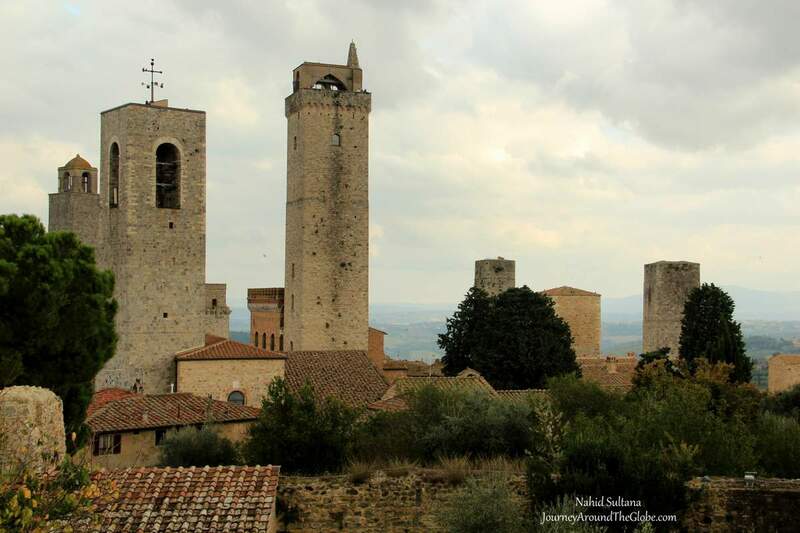 Here are some of the places we could see during our short trip in Volterra. 1) PIAZZA dei PRIORI: This is where we first stumbled while trying to figure out what we want to see and do here. Though it was late and the square looked empty, Piazza dei Priori is the main square here. Volterra Town Hall and Palazzo dei Priori were located in this square. Palazzo dei Priori was open till 5pm, so we couldn’t really explore what that really was. By the way, the tourist information center is also in this piazza, if you need to pick any maps or talk to anyone for help. 2) MARIA ASSUNTA CHURCH CATHEDRAL: After the piazza, we walked few minutes following the sign to go to the Duomo or Santa Maria Assunta. 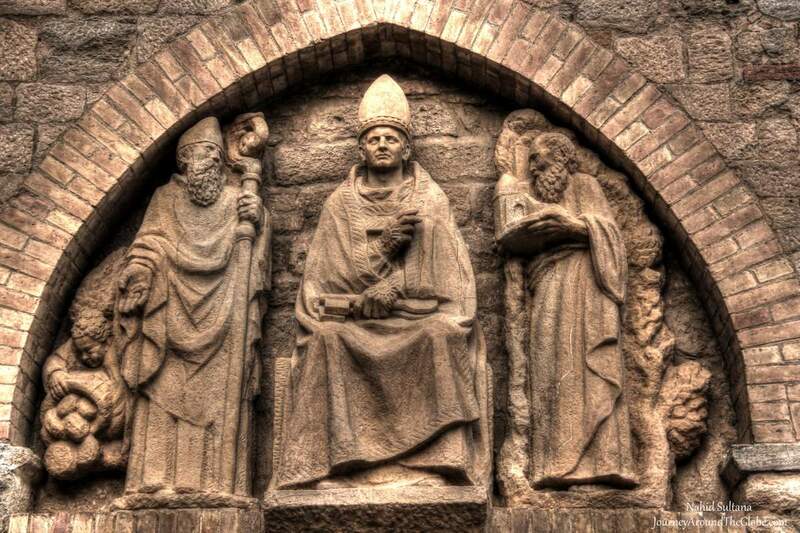 The first mention of Church of the St. Mary dates back to 992 AD. 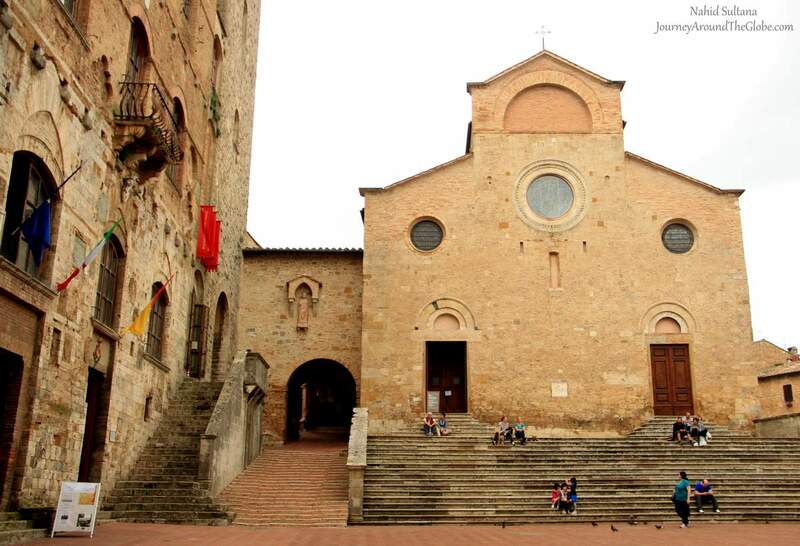 This is a Parish cathedral of Volterra in the heart of the town. Some of the most important sites of this church are the main altar, splendid pulpit, Bishop’s chair, and mesmerizing ceiling, which represents the heaven. The interior differs from the exterior in that only a little of the old Romanesque structure remains in it. There is a Baptistery in front of the Duomo and they both are located in Piazza San Giovanni. Inside the Duomo was very dark and Gothic looking. It was about to close, so we entered and exited after getting a quick peek inside the Duomo. Both the Duomo and the Baptistery are free to enter. The Baptistery was very small, had a marble wall and a painting…another brief look for me. 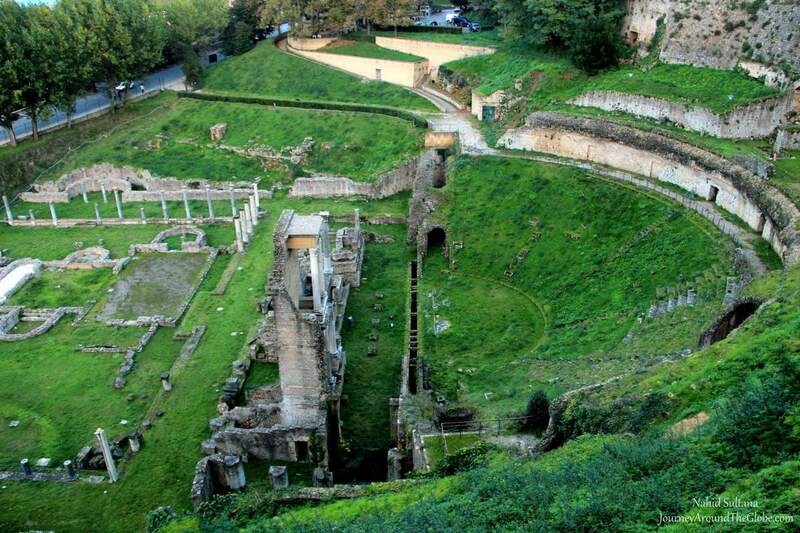 3) ROMAN THEATER: Roman Theater was about 10 to 15 minutes of walk from the Duomo. It was only ruins and the site was not a well-maintained area. We saw some ancient columns and grass-covered steps from the Roman times. Tourists can walk and go closer to the decayed site. We only browsed it from up above, where you can stand and enjoy some other views as well. 4) ALABASTER MUSEUM: We kind of got lucky with this museum. It was already dark to do anything else. But the Alabaster Museum was still open and we had only an hour to look around. If I can remember correctly, the museum had three floors in total with old alabaster items on display from different eras of Volterra. Volterra had its own alabaster mines at one time and all the items you see here are mostly local artifacts. It is 8 euros per adult for both Alabaster and Pinacotec Museum. 5) PINACOTECA MUSEUM: Alabaster Museum and Pinacoteca Museum are both in the same building. The building, known as Palazzo Manucci, is from the 16th The museum has a collection of paintings from the 14th century which includes religious arts and paintings on woods. You can see some medieval sculptures, some church ruins from the 12th century, and old altarpieces.